Looking for the best movers in Reston? If you choose Craig Van Lines as your Reston moving company, you’ll soon realize that the hardest part is over. With almost a century of experience in the Northern Virginia moving industry, we deliver – on time, every time. Craig Van Lines is a family-run Reston moving company focused on the customer. We make sure to engage with our clients and are continually evolving in order to provide top-quality moving and relocation services to each and every one of them. Our passion for excellence can be seen in our customer service, attention to detail, value-added services, experience, and our people. Planning a move in or around Reston? We are the company to call! Our moving and storage experts stand above those other 2 guys and a truck moving type outfits! You can be assured of unequaled service and a stress-free moving experience with us. Whether you are making a move across the street, across Reston or beyond, you can trust and depend upon us to be efficient, careful, and affordable. Upsizing, downsizing, or just looking for a change: Craig Van Lines is the one and only name to know, the the best movers in Northern Virginia, for any job, any size on any timetable. Our licensed, Bonded & Insured moving pros provide quick and efficient moving and packing services on an hourly basis. We serve other places too like Herndon, Great Falls, and Wolf Trap. Rates can vary by location and by the time of year, so please give us a call to determine how best we can serve you. When you contact us, all will be clearly explained with the next step being an accurate estimate for your review. Our highly trained professional packers will do as little or as much packing and unpacking that you require. Our pro packers know how to use time-proven techniques to safeguard your valuable possessions. You want it all? We provide full packing and unpacking service for those who choose to have the whole house emptied and then the new home, apartment, or office furnished on your behalf. You want some? Our partial packing service allows our pro movers to take on part of the job like a room in the house, a full garage or attic; you name it. Feeling delicate? If you only require help in packing fragile items like china, glass stemware, or your fine collectibles, you might choose our packing experts to take good care of your delicate belongings. We also offer a crating service to better protect your larger and more delicate items. If you require storage for your belongings, we have secure, temperature-controlled, and clean warehouses available. We are also glad to transport your items to any other storage facility you choose. Some examples we recommend are located at 12260 Sunrise Valley Drive, Reston, VA 20191, 2055 Mercator Dr, Reston, VA 20191, 11654 Plaza America Drive #915, Reston, VA 20190, 11405 Sunset Hills Road, Reston, VA 20190 and others nearby. We’re not the only ones saying we’re the best moving guys! First Rate and their business side is very understanding and supportive of unusual situations and needs. They were able to work with me to get through a stressful event. Great Experience. I noticed Craig Van Lines in a local flier in the newspaper and liked that it was easy to get a quote from them. I hired them to pack up an entire home and move the things into storage. Everything was well handled on the packing side. As for the unpacking and storage, they had to take back their own materials so I hope things stay safe, that’s not on them though. The movers had a good attitude during the whole process and I would use them again if need be. Excellent service from start to finish. Loaded from a four story townhouse. Staff did an excellent job with no damage to furniture or walls. Worked very hard. Unloaded to zero stairs, but driver had to unload on his own. Worked extremely hard among chaos of builder still working in condo. Driver was very professional throughout the whole ordeal. Highly recommend. Excellent movers! 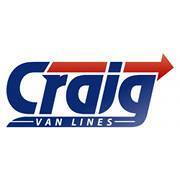 This is the 4th time we have used Craig Van Lines…we have used them for local move and now a few hours South. We were pleasantly surprised to have the same moving crew we had from our first move. Extremely professional and friendly. Made the move happen with no worries. Reasonable rates and dependable people! Give us a call to find out more about our many storage options and our reasonable rates for moving! We are consummate professionals with the expertise to ensure a smooth moving experience. We work our magic in places like Lake Anne, Hunters Woods, Tall Oaks, South Lakes, and North Point and more in the 20190, 20191, and 20194 zip codes. Contact us today and learn why we are the preferred movers in Reston. Thank you for taking the time to complete a review of our company. It was a pleasure doing business with you. We appreciate your willingness to recommend us to others. Thank you! The guys moved my antiques with care, during a hailstorm, and with good humor. Probably one of the better moving experiences I've had. They worked independently, which I appreciated since I was running back and forth between two homes the entire time. The office staff, Dilegny and David, were responsive, courteous, and flexible. Thank you for completing a review of our company. We are happy to hear that you were happy with the level of service we provided to you. We welcome the opportunity to service your relocation needs in the future, should the need arise.